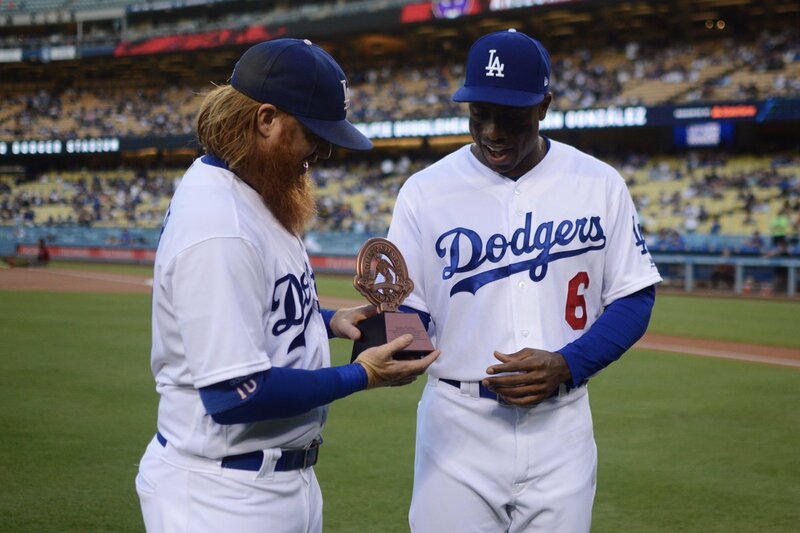 Here is Curtis Granderson presenting an nominee award to Justin Turner for being selected the Dodgers representative for the 2017 Roberto Clemente Award. This Day in Dodgers History: In 1889 the most controversial game in American Association history is held in Brooklyn. The St. Louis Browns hold a 4-2 lead in the ninth over the Bridegrooms and claim it is too dark to continue. The lighted candles in front of their bench make umpire Fred Goldsmith determined to finish the game no matter what. Several St. Louis players are hit with bottles as they leave the grounds. The Browns will forfeit the game the next day because they fear for their safety. In 1903 the Brooklyn Superbas (Dodgers) and the NY Giants play a two-stadium, same-day doubleheader. The first game began at 10:30 AM at Brooklyn's Washington Park (Giants won, 6-4), and the second game got underway later that afternoon at the Polo Grounds (Brooklyn won, 3-0). In 1924 the pennant race between the Dodgers and Giants got crazy. So much so, a calvacade of fans with crowbars stormed the Ebbets Field gates to watch the already sold out game. 200 officers were called, but an estimated 7,000 fans got in anyway. In 1962 Maury Wills stole four bases against the Pirates to break the modern National League record for stolen bases at 82. In 2001 Shawn Green hit two homers against the Cardinals at Busch Stadium to eclipse a Dodgers franchise record for home runs in a season. Green would finish the season with 49 home runs. Happy Birthday, Dave Wallace, Dave Foutz, Ed Poole, Lew Ritter, Curt Davis, Eddie Wilson, Willie Crawford & Brent Cookson! Per Bill Shaikin at the LA Times; "Dodgers' Enrique Hernandez worries about family in Puerto Rico because of Hurricane Irma." 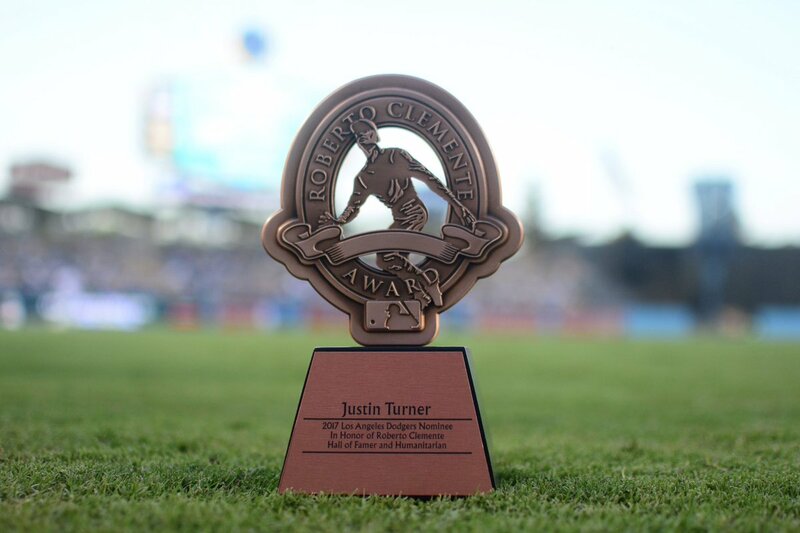 Per Eric Stephen at True Blue LA; "Dave Roberts: ‘We’re going to win the division, I can assure you of that’"
Via Matthew Moreno at Dodger Blue; "Drillers’ Kyle Garlick Named Texas League Player Of The Week (Aug. 28-Sept. 4)." Per Barry Bloom at MLB.com; "A-Gon's status among many LA questions." "That's a possibility," Roberts said about the 35-year-old A-Gon missing the playoffs. "I know this has been a frustrating season for him because he's a player who's posted for so many years and now his body is not letting him do what he wants to do. "I think right now where we're at is, his back is a day-to-day thing. There are certain days when his back feels good and there are other days when he can't get around and move well. I can't say, or Adrian can't say, where we're going to be at the end of the month." For the collector who thought they had everything. Check out this Baseball Card Sorting Robot here. 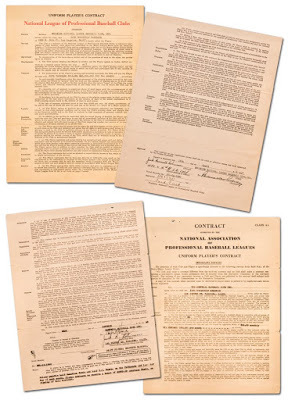 Jackie Robinson’s original professional baseball contracts with the Brooklyn Dodgers and the Montreal Royals will be coming for sale through a live auction by Goldin Auctions at the Jackie Robinson Museum in mid-November. 10% of the proceeds will go to the Jackie Robinson Foundation. 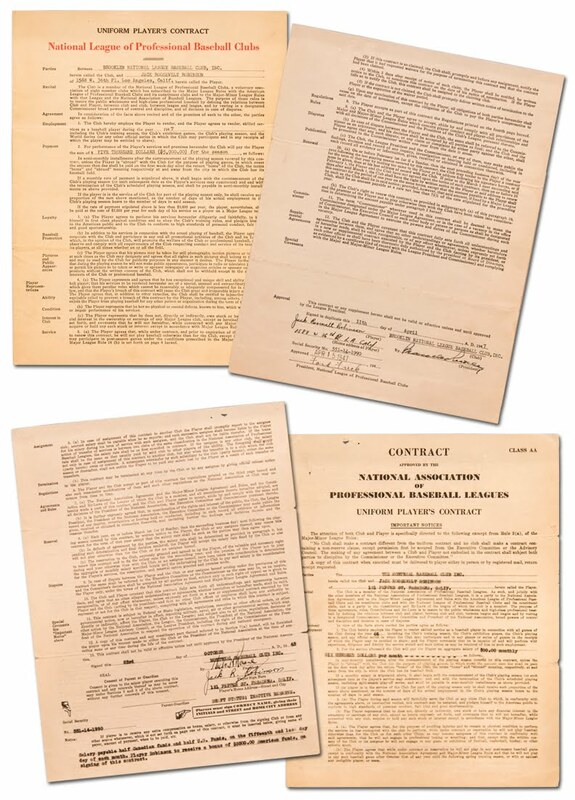 These two contracts will be sold together (one dated 1945 and the other 1947) and are thought to be the only copies in existence. The Dodgers have already indicated that they no longer have original copies of these contracts. A recent appraisal placed their value at $36 Million. You can check it out here.